The agreement is formed when accepts a booking. A written or verbal acceptance of a quotation will be deemed a booking. This agreement will be upon the terms set out within this hire terms and conditions. Only variations or amendments made in writing by 1st 4 Coaches will be considered to take precedence over these terms. Any attempted changes made either verbally or in writing that the customer purports to apply will be disregarded. The customer shall notify 1st 4 Coaches within 7 days of any concerns they may have in respect of these terms and conditions.
. That a high standard of behaviour is maintained by all passengers at all times and any instructions given by the driver are adhered to.
. No interruptions or delays of any journey in any way that may endanger the driver, passengers or risk breaching any statutory regulations relating to driving hours and duty time.
. Pick up times must be strictly adhered to. Any extra cost incurred by failure to follow this instruction will be payable to the coach operator at the time of travel.
. The customer is to ensure, prior to placing an order that the correct amount of seating has been chosen and will not load such vehicle beyond any specified seating capacity. .The customer must ensure that the relevant size of vehicle is obtained to meet any luggage requirements.
. Although 1st 4 Coaches will endeavour to take reasonable steps to prevent loss or damage, luggage is the sole responsibility of the customer and will be transported at the risk of such person. 1st 4 Coaches take no responsibility for loss or damage of passenger’s belongings.
. No consumption of food or alcohol will take place without prior written consent from either the operator or 1st 4 Coaches.
. All vehicles are non smoking; any person found to be in breach of this will be fined by the coach operator.
. Animals will not be carried without prior written consent from either the coach operator or 1st 4 Coaches.
. No bill, poster or notice is displayed on the vehicle without prior written consent from either the coach operator or 1st 4 Coaches. .The route used will be at the operator’s discretion unless a specific route has been specified and agreed in writing by 1st 4 Coaches.
. The customer will be given 1st 4 Coaches emergency contact number as well as a driver/operator number. It is therefore the customer’s responsibility to ensure they have this information with them at all times during travel. Where 1st 4 Coaches arranges any facilities such as ferries, accommodation, meals, tickets or any other services provided by another supplier, the customer must adhere to their terms and conditions as if the customer had directly contracted such services. Prices set out in our price list are current, however they are subject to change and will always be updated when prices change, the price may change in accordance with peak seasons and key dates and in times of limited availability, specification of vehicle i.e. standard/luxury or VIP your consultant will discuss this with you at time of booking. The price for services included will be set out on the invoice and booking confirmation. Any additional charges that may be incurred on the day of travel will be directly payable to the operator by the customer. Example additional costs: Extra mileage, driver accommodation and meals, parking charges, road tolls, Value Added Tax and Sales Duty Tax. In the case that a booking is made for a date of travel less than 30 days away the total value for the booking will be required. In the case that the date of travel is greater than 30 days from date of booking only 50% will be required with the other 50% to be made payable before 30 days of date of travel. It is the customer’s responsibility to ensure payment is sent promptly. If the coach previously resourced loses its availability due to slow payment then 1st 4 Coaches will attempt to resource a similar size vehicle of similar quality. Although 1st 4 Coaches will endeavour to find a vehicle for the same costs, this cannot be guaranteed due to operators different costings. The difference will again need to be paid in the same manner as explained above. If payment is not received within the specified time frame 1st 4 Coaches have the right to cancel any bookings and cancellation charges will still apply. Any services such as theatre tickets, ferry crossing, meals and accommodation that have previously been purchased by 1st 4 Coaches may not be refundable. In the case that an operator cancels its contract with 1st 4 Coaches then an alternative coach of size and quality will be sourced. 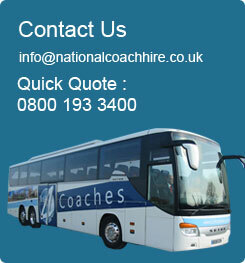 1st 4 Coaches will as always try and keep any price increases to a minimum. In the event that no other vehicles are available or the customer does not wish to continue using another operator the full cost of the vehicle will be refunded. 1st 4 Coaches will not be held responsible for an operator cancelling. The customer must notify 1st 4 Coaches in writing within 7 days after the date of travel with any complaints they may have. Should compensation be requested the customer will be put in touch directly with the operator unless the mistake lies directly with a fault of 1st 4 Coaches service, any disputes will be settled within a 10 day working period after we have received notification or unless otherwise agreed by the client and 1st 4 Coaches. In the event that 1st 4 Coaches need to refund any monies in line with the above clause, the refund will be made within 7 working days after the dispute has been settled. It is the customer’s responsibility to check the booking confirmation for any errors, then to notify 1st 4 Coaches accordingly. If this process does not take place 1st 4 Coaches will not be held responsible for any mis-instruction to the operator. 1st 4 Coaches will not be deemed in breach of the agreement or liable to the customer for failure or delay in fulfilling its obligations under the agreement due to force majeure. This includes: traffic congestion, vehicle breakdown, emergency, act of terrorism, accident, adverse weather conditions, strikes or industrial dispute defaulting of sub contractors.